Weather is finally warming up here which means the plants in our garden are really starting to grow. We used some free time this week to get caught up on a couple much-needed gardening projects which will help keep our growing plants nice and happy. 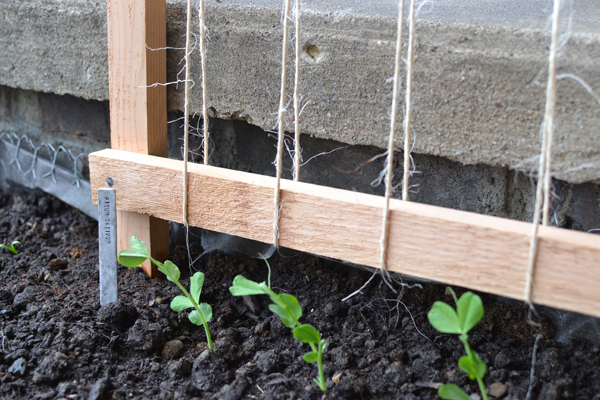 The first thing we needed to work on was a trellis for our snap peas. Once they germinated, they started growing like crazy and we knew they would want something to climb pretty soon. Our new DIY trellis is not super heavy duty but it should hold up great for our 9 little plants. We built it out of cedar 1×2’s since cedar will hold up better to outdoor use than some other types of wood. It ended up costing about $16 for all the supplies – 4 8′ pieces of wood and a box of 2″ nails. The twine was extra from wedding projects, so that was free. 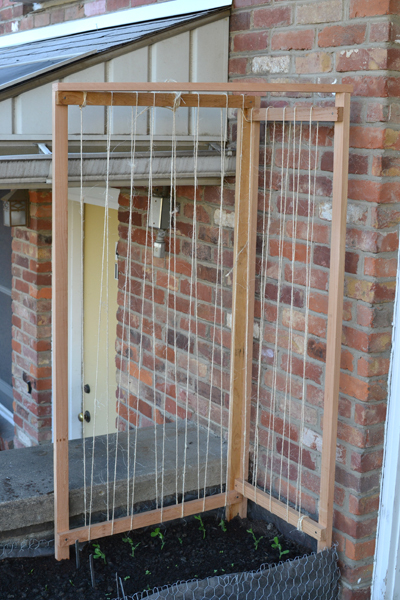 We cut the wood down to 5′ lengths and used the scraps to make supports for the top and bottom. Since it’s sunk into the dirt, the peas will have about 4′ to climb. The trellis measures 27″ wide and 18″ deep so we hardly had any waste; just a couple short pieces of wood left over for a future project! I’m really happy with how it turned out. It gives such a cozy look to that corner of the garden bed. Pretty sure our neighbors think we’re crazy, though. Don’t those little plants look happy? I can’t wait until they start climbing – I think a pea covered trellis outside our front door will be adorable. Oh, and that’s one of our hand-stamped garden markers! Since Jeth is an agriculture nerd, it’s lettered with the Latin name – Pisum sativum. 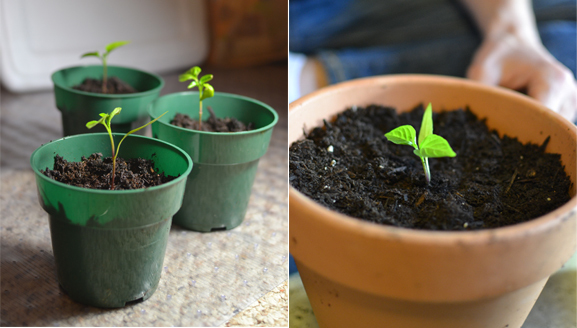 Our other not as exciting project was graduating our pepper seedlings into bigger pots. They were growing really slowly in their small 3″ pots and since they can’t go into the real garden for another month, we figured they should have new homes. We planted them nice and deep – up to their necks in soil – which will help encourage good root growth. Hopefully the bigger pots, plus a teeny dose of fertilizer and some good warm weather, will get them going again. Every time I look at our growing plants, I feel like a kid watching some kind of magic happen. Isn’t gardening wonderful? Tags: budget, DIY, gardening. Bookmark the permalink. Previous post ← Feeling Crafty?